aerobd.news : With the Polestar 1 scheduled to be production-ready in mid-2019, work is continuing apace on its test program, with a current focus being chassis dynamics and driver experience evaluation. Verification prototypes (VP) of this first model from Volvo’s spin-off electric performance brand are being tested on the road and in the lab, and Polestar has revealed that steering responsiveness and torque vectoring calibration are a priority in the latest tests, validating the chassis and suspension tuning carried out on earlier prototype cars earlier in the year. The Polestar 1 will feature a 2-liter Volvo gasoline engine driving the front wheels, assisted by two electric motors driving the rear wheels individually through planetary gear sets. This configuration enables real torque vectoring on the rear axle, rather than through brake intervention, as is so often the case on vehicles boasting ‘torque vectoring’. The Polestar 1 will be based on Volvo’s Scalable Platform Architecture (SPA), but Polestar engineers working in Volvo’s R&D department have made it their own, with around 50% of the car’s setup being new and bespoke – and rather high spec. 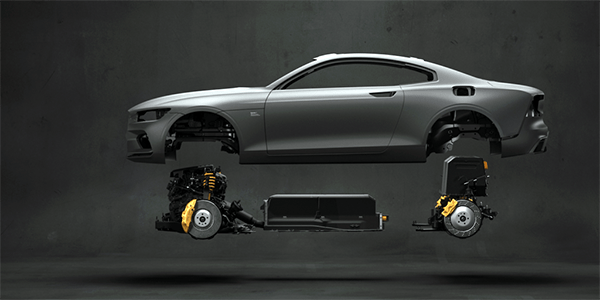 For example, the Polestar 1 will be the world’s first car to be fitted with the all-new Öhlins Continuously Controlled Electronic Suspension (CESi) damping system, which can be set to adapt instantly to road conditions in accordance with the driver’s chosen settings. The technology may be new, but the relationship isn’t, as Polestar has been working with Öhlins since 1996. At the rear, a double electric axle enables torque vectoring, while the integral link suspension has a transverse composite leaf spring instead of coil springs. According to Polestar, this suspension design delivers neutrally balanced cornering characteristics, minimum roll and low levels of NVH. At the front is a double-wishbone suspension, connecting each wheel with two transverse links to help counteract torque steer and minimize understeer. In keeping with the lightweight ethos of the car, the majority of the suspension parts are made of aluminum to reduce unsprung weight. Stopping power is more important than horsepower, and Polestar 1 has this covered, with the six-piston monobloc calipers at each front wheel milled from one piece of aluminum. The calipers, supplied by Akebono, are coupled with 400 x 38mm ventilated and drilled discs. Rydholm seems happy with the vehicle dynamics package of the car. “The ingredients for creating the best driving dynamics in a car are the same, whether it has an electric drivetrain or an internal combustion engine,” he stated. “An immediate damper response from the suspension, direct and predictable feedback from steering inputs and consistent, powerful brakes are the key attributes that all the world’s best driver’s cars have in common. That’s exactly what we are engineering into the new electric performance cars from Polestar”. The next prototype phase, which starts early in 2019, includes the first cars being built in the soon-to-be-completed Polestar Production Centre in Chengdu, China. This will be the final prototype series before pre-production cars are built to final specification and quality standards. A further two models now in the planning stages will be fully electric. Polestar 2, a mid-sized BEV due in 2019, will be the Volvo group’s first BEV and will compete with the Tesla Model 3. A larger SUV-style BEV, the Polestar 3, will follow.